Soon I’ll will tell you about five Godzilla–scale fossil–digging projects in North America that if approved will set us on a course to repeat our past with grave implications for the future of our planet. You may have already heard about some of these projects individually, but the urgency to stop them collectively is more than ever before. I’m not talking about fossil–digging projects that tell us something about our ecological past or our cultural past. I’m instead talking about digging for coal–and–oil. I remember reading somewhere that “the largest profits are made by making and selling products that go up in the air.” All through the twentieth century digging for coal–and–oil and then burning it to send carbon into the air was enough to ensure astronomical profits for a handful of fossil–fuel corporations. But I also remember the saying, “What goes up must come down.” For a hundred years, burning all that coal–and–oil gave us—the humans—great comforts, but the carbon we sent up in the air also resulted in the tremendous pain of climate change—the rapid melting of sea ice and icebergs that is destroying Arctic marine ecology, the ocean acidification and coral deaths that are causing havoc to marine life in the tropical and temperate seas, droughts and beetle infestations that have killed hundreds of millions of trees around the world, intense forest fires and floods—remember Russia and Pakistan this summer? The list goes on and on ... you know the story. Our planet is also experiencing the greatest rate of biodiversity loss ever and climate change will continue to worsen the ongoing tragedy of species extinction. In terms of calendar years, we stepped into the twenty–first century about ten years ago, but in all other ways we have continued to live the life of the twentieth century, with our ongoing love affair with coal–and–oil. If you think we are entering the twenty–first century with a wonderful clean energy future that will be healthy for all life on earth, think again! If there is one thing the U.S. midterm election has guaranteed, it is this: Oil and coal lobbies and their climate denier supporters in Congress are ready to force us farther into the new century with another one hundred years of fossil–digging in North America. Right now they’re probably eating gourmet steak flown in from Argentina to gather strength and drinking fine Italian wine to gather passion to unleash an unprecedented fossil–digging campaign after the 112th Congress is sworn in come January. The process has already begun. Last week Shell Oil launched a massive ad campaign to pressure the Obama administration into allowing them to begin drilling in the Beaufort Sea of Arctic Alaska during 2011. The New York Times reported, “The company (Shell) is placing ads for the rest of the month in national newspapers, liberal and conservative political magazines and media focused on Congress.” In late May, as the disaster in the Gulf of Mexico was unfolding in front of our eyes (a long–forgotten event for our amnesiac culture), I wrote a story titled “BPing the Arctic?” that pointed to the dangers if President Obama allows Shell to drill in the Beaufort and Chukchi Seas of the Arctic Ocean. I also wrote about Shell’s “Let’s Go” ad campaign in September. If you read these pieces and understand what’s now unfolding, you’ll know Shell isn’t kidding around: They’re spending a lot of money that will go far toward their plan to drill in the icy Arctic Ocean. President Obama ought not to cave under the pressure of Shell’s ad campaign and must not issue the permit for 2011 Beaufort Sea drilling, and also Chukchi Sea drilling if they later ask for it. How Much Fossil Fuel Are We Talking About? It’s worth taking a quick look at some of the numbers from five massive fossil–digging projects that the fossil–fuel lobby will be pushing hard during the 112th Congress. Polar Bear cubs and mother play near their den on Canning River Delta along the Beaufort Sea coast, Arctic National Wildlife Refuge. After gaining strength the cubs would leave with their mother to begin life in the Beaufort Sea. Photo by Subhankar Banerjee, 2002. By current estimates, there are some 30 billion barrels of oil in the Beaufort and Chukchi Seas of Arctic Alaska. Let’s put that number in perspective. In the U. S. each year we consume a little over 7.5 billion barrels of oil, so those 30 billion barrels only amounts to 4 years of U. S. consumption. Not that long, right? But that’s not how it works. We don’t eat dinner with just a big hunk of steak only — we may eat a salad before, plus a bit of steamed veggies, maybe even a baked potato, add a glass or two of wine or margarita, then maybe some desert, and even a cup of decaf coffee. Add all that up, and a 15–minute act is extended to an hour and a half. It’s the same way with America’s energy consumption, with oil coming from elsewhere and also coal, gas, and tar sands contributing to the energy needs. Shell could potentially keep drilling in the Arctic Ocean for the next twenty or thirty years. In the process, they’ll create massive dead zones in a cold, slow–growing habitat that will take centuries to heal, unlike the warm Gulf of Mexico, where things grow relatively fast. We must fight to stop Shell from drilling in America’s Arctic Seas. For the past ten years, much of my work has focused on the ecological and human rights issues in the Arctic National Wildlife Refuge, the most biologically diverse conservation area in the Arctic. I have worked closely with human rights organization Gwich’in Steering Committee in Fairbanks, Alaska and with activist environmental organization Alaska Wilderness League in Washington, D.C. PROTECT: CARIBOU AND SALMON, Gwich'in Human Aerial-Art, Fort Yukon, Alaska. Photo by Cammy Roy, July 21, 2010. BP’s oil–and–methane spill in the Gulf of Mexico prompted Alaska Native peoples of the Gwich’in Nation to gather in late July in Fort Yukon, Alaska at the confluence of the Yukon and Porcupine Rivers. They created a magnificent human aerial–art PROTECT with images of caribou antler and salmon, two species the Gwich’in communities critically depend on for subsistence food, and both these species are threatened by climate change and potential oil–and–gas development. I’d urge you to visit the Gwich’in Steering Committee website to learn about the human–rights implications of drilling in the Arctic Refuge and the important work they have been doing since 1988 for the protection of the Arctic Refuge coastal plain from oil–and–gas drilling. So how much oil is there in the Arctic Refuge? Best estimates go from about 7 billion to 16 billion barrels, meaning 1 to 2.5 years of U. S. annual oil consumption. Again, with some help from other energy sources, oil companies could potentially keep drilling in the Arctic Refuge for ten years or more. In the process, they’ll turn one of the most important ecocultural regions in the entire Arctic into an industrial wasteland and then leave. 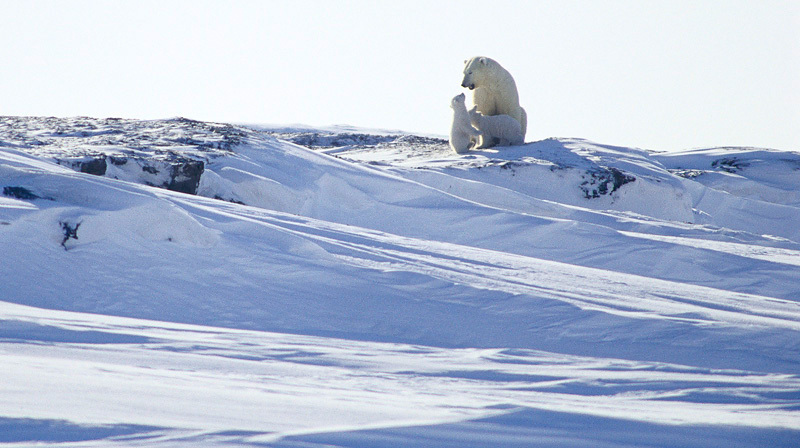 As it happens, the 50th anniversary of the Arctic National Wildlife Refuge is on December 6. Photographer Jeff Jones and writer Laurie Hoyle has just published a magnificent photo–essay book Arctic Sanctuary: Images of the Arctic National Wildlife Refuge that you can check out. And conservation organizations have a proposal in front of President Obama to once–and–for–all designate the Arctic National Wildlife Refuge as a National Monument, which the President ought to do before the start of the 112th Congress. I doubt you’ve heard of the Utukok River Upland in northwest Arctic Alaska, or the projection that it contains the largest coal deposit in North America—an estimated 3.5 trillion tons of bituminous coal, which is nearly 10% of world’s known coal reserves. Let’s put that number in perspective. The annual coal consumption in the U.S. is about 1 billion ton, which means at the current rate of consumption we could potentially burn the Arctic coal for the next 3,500 years. No, that’s not a typo—3,500 years! Burning coal for the past couple of centuries has brought our planet earth down to her knees with toxicity and now climate change. Can you even imagine what it would mean for life–on–earth if we burn all that coal for the next 3,500 years? 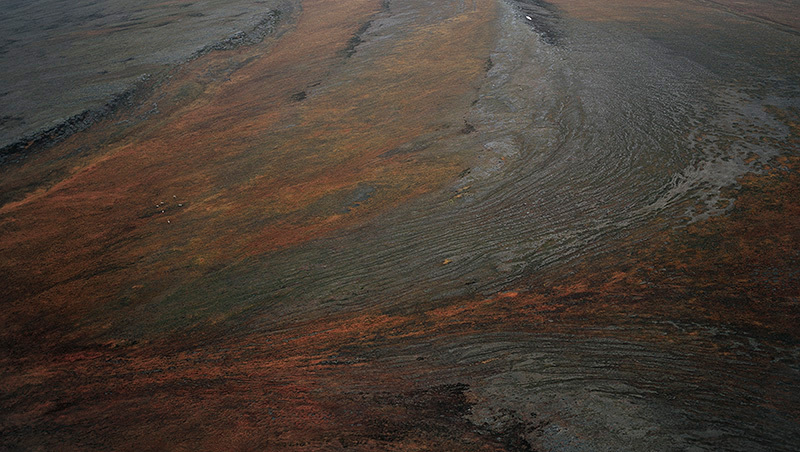 Caribou Tracks deeply etched on coal seams from centuries of migrations, Utukok River Uplands. Photo by Subhankar Banerjee, 2006. Much of that Arctic coal sits atop the core calving area of the Western Arctic caribou herd, the largest caribou herd in Alaska, estimated at some 377,000 animals that nearly 40 indigenous communities from three tribes—Inupiat, Yupik, and Athabascan—rely on for subsistence food, as well as cultural and spiritual identities. That coal is also on or near the surface of the land, meaning the development will be mountaintop removal, not unlike the devastation that has been taking place in the Appalachian coal belts of the American Southeast. I first went to the Utukok River Upland in June 2006 with writer Peter Matthiessen and other colleagues. We witnessed caribous with newborn calves, wolves that seemed to have never seen a human before, grizzlies that ran away at catching our scent, birds that were nesting on the tundra and on the cliffs of riverbanks, and so much more. We came away with a great appreciation for the ecological fecundity of this magnificent and remote region. If you’re curious, you can read Peter’s essay on the experience, which appeared in The New York Review of Books, and my essay, which appeared in the anthology Alaska Native Reader: History, Culture, Politics. While no coal development permit has yet been given in the Utukok River Uplands inside the National Petroleum Reserve–Alaska (NPRA), but in 2006 the Canadian mining company BHP Billiton began exploration just outside, in the land owned by the Arctic Slope Regional Corporation, where the Western Arctic caribou herd with their newborn calves gather in massive numbers, up to 250,000 animals during their post–calving aggregation. We must make sure no permit for coal is ever given in the NPRA federal lands. There is one serious catch. Tar sands and shale oil are the dirtiest forms of energy and are the most environmentally destructive in its recovery and production. They produce far more greenhouse gas than conventional oil and gas, meaning more accelerated climate change, and require huge amounts of water for their production. It takes 2.5 to 6.5 gallons of water to produce 1 gallon of tar sands oil. You can do the math—this is certainly not sustainable. At a time when the American West is already suffering from massive droughts and high temperatures due to climate change, these unconventional fossil–digging projects will undoubtedly spark great wars over oil–or–water. In late September, leading climate scientist Dr. James Hansen and more than 100 activists from Appalachia Rising were arrested in front of the White House in Washington, D.C., for protesting mountaintop removal coal mining in the Appalachia. Jeff Biggers reported, “Appalachian residents are calling on the EPA to halt any new permit on the upcoming decision over the massive Spruce mountaintop removal mine.” The Spruce No. 1 mine in Logan County, West Virginia, would be a gigantic mountaintop removal mine that would bring great devastation to the region by destroying thousands of acres of forests, burying 7 miles of streams, and ending the way of life of many Appalachian families. So how much coal is in the Appalachia? The Energy Information Administration has estimated that there are about 53 billion tons of coal reserves in the Appalachian Basin. Potentially we could be digging for that coal for the rest of this century. But that coal will come to us with great devastation. If you’d like to know more about the great social and environmental costs of mountaintop coal mining, you can check out this article, “Coal Controversy in Appalachia,” published in NASA’s Earth Observatory website. On October 15, EPA administrator Lisa Jackson recommended the withdrawal of the Spruce No.1 mining permit. With climate deniers firmly placed in the 112th Congress, we can surmise safely that this fight is far from over. The beginning of coal–and–oil has been the beginning of the end of sustainable living on earth; to make an end for coal–and–oil would ensure a beginning for clean energy. But unless we make such an end, there’ll be no beginning for clean energy to take us back to sustainable living on earth. Next year the First Family will be taking showers with water warmed by the mighty sun falling on the solar panels that will be installed on the roof of the White House. But such small symbolic action and other clean–energy initiatives will be meaningless if the five fossil fuel projects I mentioned take off happily during the 112th Congress. Art—Find out about 350 EARTH (November 20–28), the largest human aerial–art installation ever to fight climate change, and see how you can get involved. Letter—Write a letter for the ‘Million Letter March: The Write Way to Stop Climate Change’ campaign. Petition—Sign the Alaska Wilderness League ‘Keeping it Wild’ petition and urge President Obama to designate the Arctic National Wildlife Refuge as a National Monument. 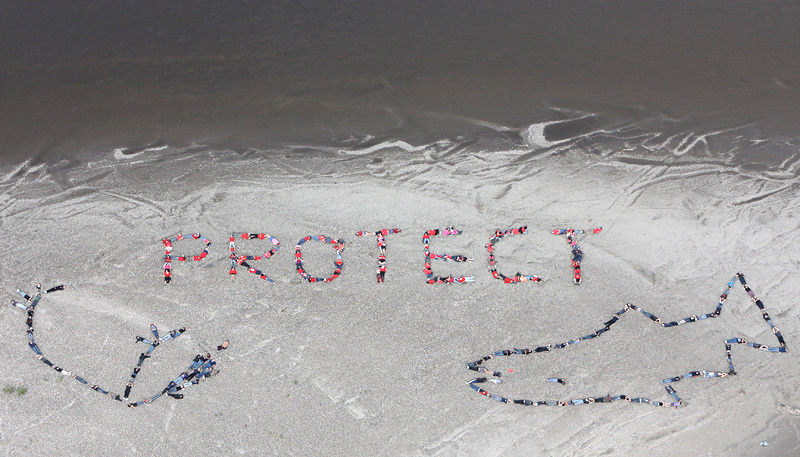 LTE—Write ‘Letter to the Editor’ opposing Shell’s 2011 drilling plan in the Beaufort Sea. Posters—Work with artists and writers in your community and create posters on all of the five projects I mentioned and distribute them throughout your town to educate your community members. Being informed about these fossil–digging projects is the first step toward engagement that may lead to action. For our part, we’ll regularly present stories on this series at ClimateStoryTellers.org.